Sri Lanka Cricket has decided to offer annual contracts to around 70 cricketers in the category of youth, emerging and senior players in a bid to encourage them to press for places in the national team and put pressure on the current players. “There are so many categories of players who are playing cricket so we must look after them. 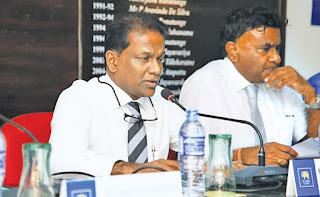 We want the players who have not played for Sri Lanka not to be idling in club cricket but to start putting pressure on the national players and make every effort to play for the country as well as their clubs,” said SLC president Thilanga Sumathipala addressing a media conference at SLC headquarters yesterday. “We have decided to look after these cricketers and put them on a national contract. We met about 70 players last Saturday and gave them a proposed agreement and we are informing our member clubs that if there are anybody whom they feel are worthy of contract to inform us. “We will sign the contracts on October 30. The contract lasts from November 1 to April 30. After that date they are free to play in any part of the world. We want to see that our domestic is stronger and protected and give the players something they can be happy about. Apart from the national players we are also looking after the other players as well,” Sumathipala said. The players’ will be paid between Rs. 25,000 to Rs. 100,000 per month.